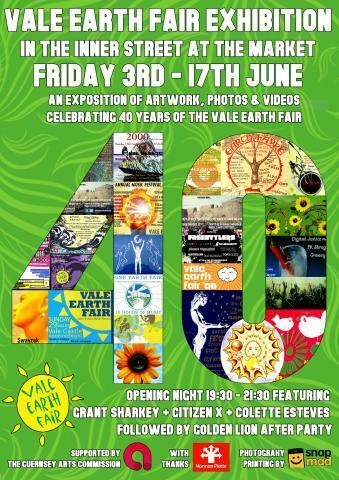 In celebration of its 40th birthday, the Vale Earth Fair is holding an exhibition in the Inner Street of the Market in St Peter Port. The exhibition runs from Friday 3 June 2016 for 2 weeks, and will display artwork, photos and videos covering the full history of the festival, from it's dusty beginnings running off an extension lead from Gamble & Blair's yard in 1976 to the present day extravagansa. The opening night is open to the public from 7:30pm on Friday 3 June and will feature live music from Grant Sharkey, Colette, and Citizen X, closing around 9:30pm when we'll all head along the road for an after party in the Golden Lion - hope you can join us!